Roberto Carlos has already informed Delhi Dynamos president Prashant Agarwal about his decision. 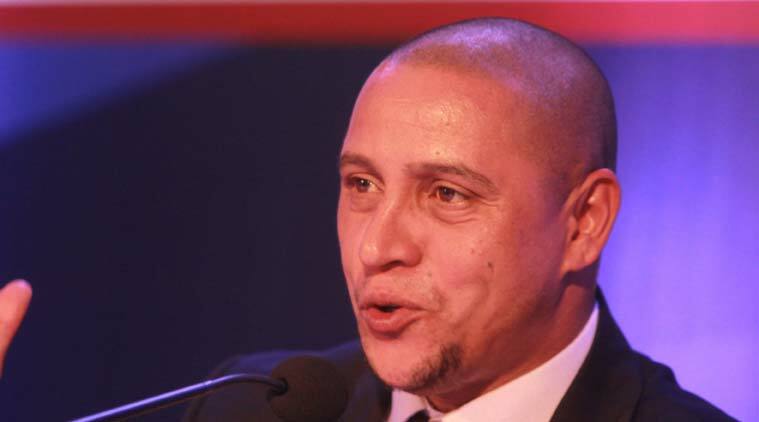 Roberto Carlos might not return to India on a coaching assignment next year. Without any prior warning, the press conference that was meant to be about the semifinal between two of the strongest sides this season descended into a farewell for their legendary bosses. Roberto Carlos and Zico have been among the most influential coaches this Indian Super League, leading Delhi Dynamos and FC Goa respectively with casual brilliance. But the two ‘supers’ in this season’s ISL will not be returning next year. While Carlos has already informed Delhi Dynamos president Prashant Agarwal of his decision, Zico’s contract expires at the end of this season and he will be ‘analysing offers from European and Asian clubs.’ He, however, has left the door ajar for his return. Carlos was more direct. He, too, mentioned ‘better offers in Europe’ as the reason to not return next year. “Next season I won’t be coming. In every professional life, you go with opportunities that come. You perform well and someone else comes with an offer, that’s how it goes,” Carlos said, without elaborating further on the ‘offer’. Without doubt, the Brazilian greats were the biggest names, on and off the field, this season. They brought credibility and creativity with them, along with a fresh approach that depended on flair and, as Zico insisted, playing fair. That the two teams occupied the two top positions throughout the league stage was a testimony to the tactics used by their managers. On Friday, the two teams will square off in the first semifinal of the ISL at the Jawaharlal Nehru Stadium here. It will also be a clash where the master will be up against the apprentice. Carlos was coached by Zico when he played for Fenerbahce in the Turkish league and considers him a father-figure. In the two league matches Delhi and Goa have played so far, Zico has outwitted Carlos, winning the home leg 2-0 before masterminding a 4-0 away win last week. This will be Zico’s second appearance in the semifinals. Last year, Goa bossed through the group stages but lost in the last-four stage. Many expected that Zico won’t return this year after he threw his hat into the ring for FIFA’s president’s post. He ultimately did not run for it, and insisted he won’t be gunning for it in the future as well. “I want to carry on as coach. I have some opportunities that may happen after end of this year. FIFA was like a part (time) case. I did not allow it to impact my coaching. A lot of people said I would be distracted because of the FIFA (issue) and be negligent with Goa but the result is there,” he said. But the Brazilian has continued to keep an eye on the events in South America as well as Zurich and believed the players, ultimately, have to step up and protect the game. “All these things make me very sad. They have damaged football and should be jailed. Players now should get together an take care of football,” Zico said. His thoughts return to the task at hand. It’s the penultimate battle of the Brazilian legends on Indian soil and Zico hopes ‘student won’t overcome the master.’ On Friday, he will have his full squad at disposal against Delhi, whom he expects to come hard at them. A self-confessed fan of Carlos the player, Zico likes what he sees from Carlos the manager. “We all start somewhere. Carlos was a fantastic player and then had an opportunity to coach in Turkey. He has done a great job here and proven he is a very nice coach. I had the pleasure of being his coach at Fenerbahce. But I hope student doesn’t overcome the master here,” he said. FC Goa accused Dynamos of resorting to ‘dirty tactics’ on the eve of the semifinal after they were not allowed to practice at the Jawaharlal Nehru Stadium on Thursday. Goa officials claimed they were informed at the last minute that the stadium was rented out for a school event, which resulted in players not being able to train properly. The team will be writing an official complaint to the ISL on the issue.